An exceptionally smooth gin handcrafted by lifelong friends Tom Warner and Sion Edwards in a barn in Harrington, Northamptonshire, including ingredients from their farms in England and Wales, a truly fabulous creation of which all of Britain can be proud. Soft nose of vanilla and toffee aromas with spice following. Sharp spice beginning on the palate, with sweet ginger and juniper flavours coming through. Creates a very long, mouth-watering finish. A great sipping gin, and one that's versatile enough to involve itself within a cocktail. The smoothest Gin i have ever tasted and local too. This Gin is not the cheapest but I honestly believe you get what you pay for but in this case that is wrong! This is worth much much more! 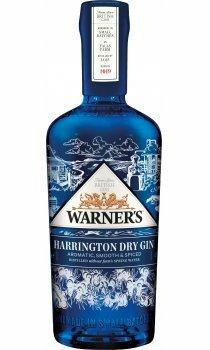 I liked this Gin so much I paid extra just to get hold of a bottle from their very first batch. Dont bother reading anymore just click "buy it now" and try it for yourself.